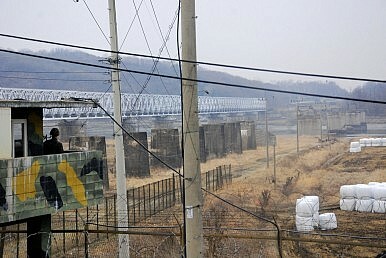 Rows of loudspeakers are assembled along the South Korean side of the border with its neighbor North Korea, like eager rockets bundled together in a launcher. Dormant for years, they have recently been reenlisted to flood the other side of the border with words or music. Both Korean states use speakers, but the Republic of Korea likes to include K-pop, its version of commercial popular music, in its cross-border propaganda arsenal. That much is well known. But have you ever wondered exactly which songs South Korea uses to bombard the either side with? And should we try to draw any conclusions from the playlist? In 2010, one of the responses to the sinking of the South Korean warship Cheonan was to play a song called “Hit Your Heart” by 4Minute. Some claim that part of the song’s lyrics – like the phrase “I do what I want and I do it my way” – could serve a propaganda purpose, yet the song as such is about dreams of fame. Later, during the August 2015 stand-off that was triggered by the wounding of two South Korean soldiers by a North Korean mine, the Republic of Korea broadcast a musical piece with a warlike title: 뱅뱅뱅 (“Bang Bang Bang”). The piece is sung by a band with a similarly bellicose name: BIGBANG. Again, we should add, the song’s subject – to the extent that there is one – has nothing to do with war. The two other hits reportedly played at that time were “Genie” by Girls’ Generation and “Heart” by IU, both very much in the boy-girl genre. This year, on January 8, in response to the North’s nuclear test, the three songs known to be played were “Me Gustas Tu” by GFriend, “Just Let Us Love” by Apink and 백세 인생 (“A Hundred Years of Life”) by Lee An Ran. “Just Let Us Love” as a message may make sense, but if we really insist on finding some meaning in the titles or lyrics of the chosen hits in the context of inter-Korean relations, then “Me Gustas Tu” (literally, “you are pleasing to me”) would evoke a more lukewarm sentiment. Some claim that the selection is based on the thinking that South Korea wants to depict itself as a high-tech, advanced country. The preferred songs would thus include modern techniques, as indeed does “Bang Bang Bang,” which, like the even more famous “Gangnam Style,” is heavy with techno vibes. But the choice of one 2015 hit, “A Hundred Years of Life,” would not fit that strategy at all. Lee An Ran’s delicate voice, the song’s gentle line, and the traditional idiom should appeal to North Koreans of all generations, and not just to fashion-following youth. Some observers point to the song’s apparently ominous reference to the coming of the “angel of death,” but this lyric is not about war or about comparisons of average life spans, it is simply the singer asking the Grim Reaper to spare her for another few years. In short, it is difficult to find much strategy in the choice of songs (although admittedly your correspondent doesn’t claim to be an expert in these matters). K-pop is reportedly vastly popular in North Korea, but it not legally available. This may be the only explanation needed. As RoK’s defense ministry spokesperson admitted, it is about selecting “a diverse range of most recent popular hits to make it interesting.” In other words, South Korea is hitting the North with its hits. Or, to use an expression from one of these songs, it is hitting the heart of its Northern brothers.